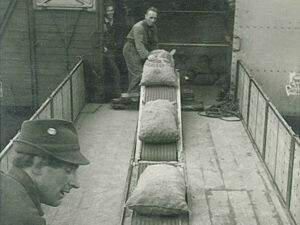 In 1942 the Noordoost polder ran dry. 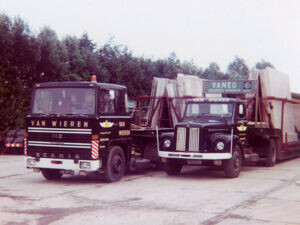 The brothers Jan and Lukas van Wieren worked as drivers for their brothers in the Wieringermeer polder. A lot of work was done for the Management Wieringermeer, in short called “The Management”. 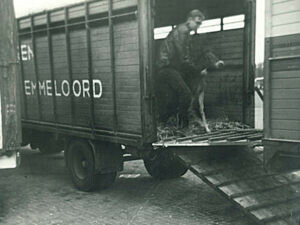 That organisation was also responsible for the cultivation of the Noordoostpolder (NOP). Shortly after the drying they moved to the NOP. 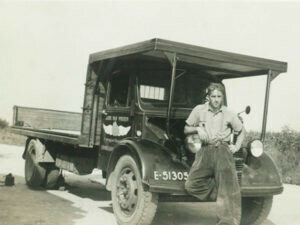 A Ford truck with trailer was bought. 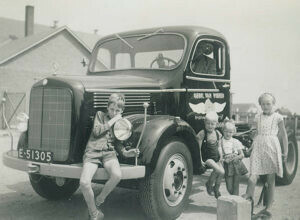 Jan drove that and Lukas was given a vehicle from Wieringermeer. They worked for the Management with those. It was war. 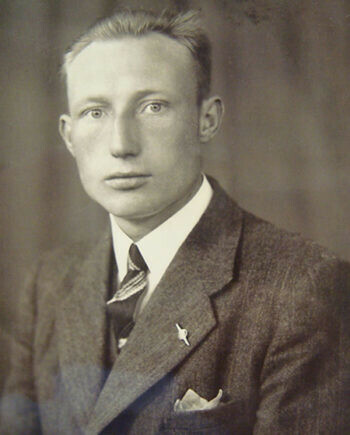 In October 1944 Jan’s vehicle was fired at from the air. They then stopped after hiding the vehicles under straw. 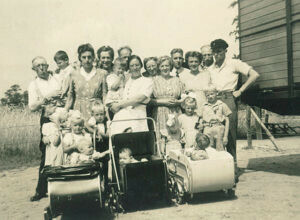 In May 1945 they return to the polder and carry on where they left off. 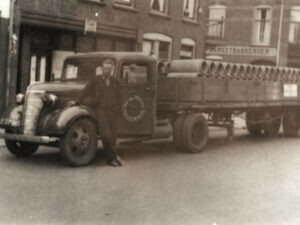 On 1 October 1945 they register their company with the Chamber of Commerce as “gebroeders van Wieren” (“Van Wieren brothers”). 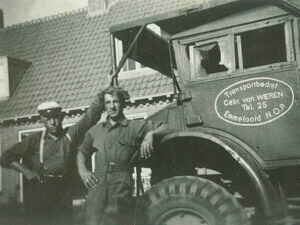 The transport company then was one of the first companies in Emmeloord. 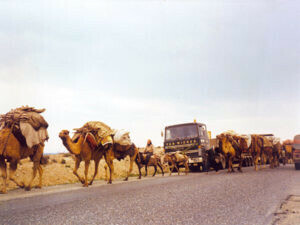 In the early days they mainly transported building materials, cattle, household effects, machines and agricultural products. 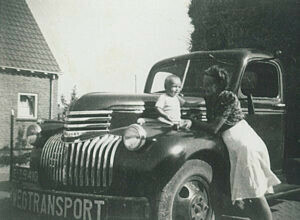 The office was in house and the garage was a so-called romney warehouse, built from corrugated metal plates. 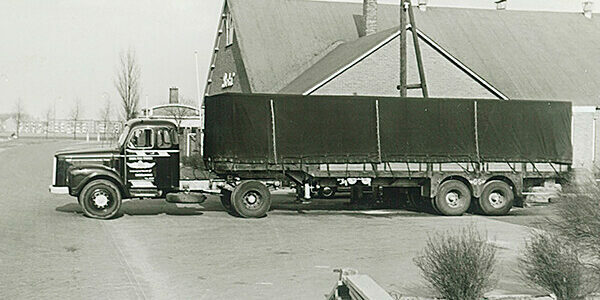 In 1953 the company moves to new premises at the Industrieweg in Emmeloord. The company now has ten trucks. 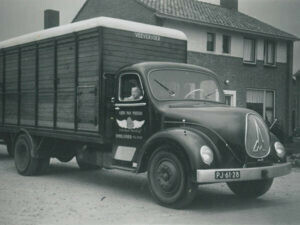 In 1956 Jan van Wieren passes away and Lukas has to continue the business on his own. 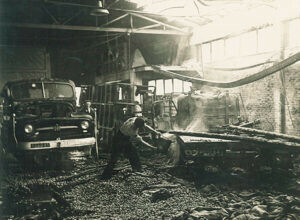 A few years later the company building suffered a fire and partially burnt to ashes. 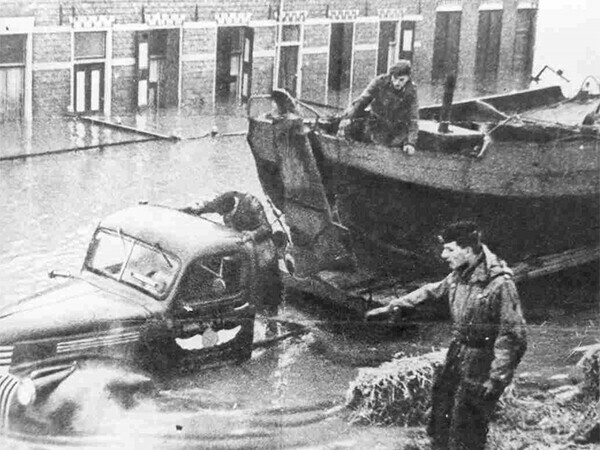 Four of the twelve cars were destroyed. 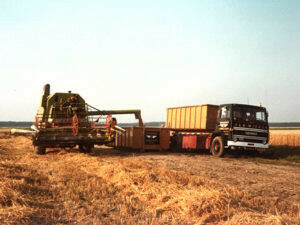 Those years were further mainly marked by technical innovations. 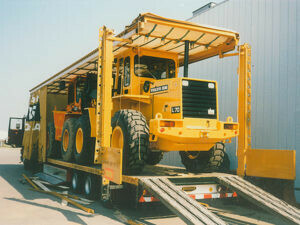 Among others a special low loader was developed for the transport of building machines and a hopper for bulk products. 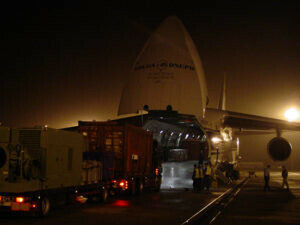 International transport to a.o. Germany and France is started. Besides the transport of agricultural products, in these years the transport of concrete walling units for housing construction is booming in particular. Also international transportation is growing. 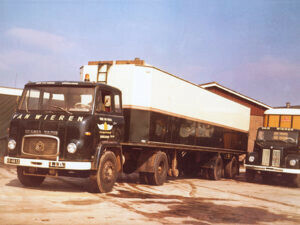 In 1972 the company transforms into a private company. 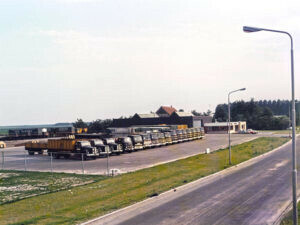 In 1973 the company moves again, into a newly constructed building at the Randweg in Emmeloord. 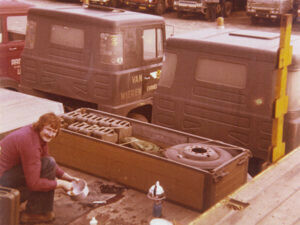 The nephews Arjen and Harm van Wieren join the management in 1976. 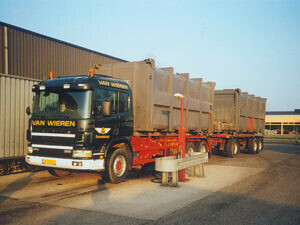 Van Wieren develops as an all-round transport company, active in the national and international market. 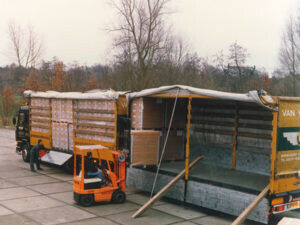 The vehicle fleet now consists of tarpaulin combinations, cooling and freezing trailers, bulk containers, containers and low loaders. Besides Germany, Sweden and Italy are two of the weekly destinations. They drive to the Middle East, to Iraq and Saudi Arabia for a few years. 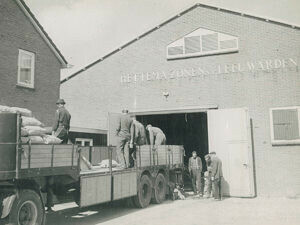 In 1980 the company was expanded with a cold store and a storage hall. 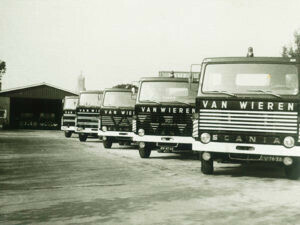 Lukas van Wieren, the last founder of the company, passes away in 1985. Growth in various types of transport, a.o. 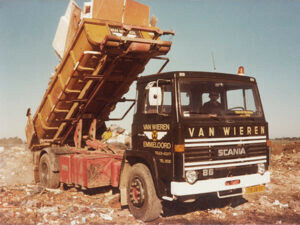 the waste transport sector for which many containers were purchased. Heavier low loader combinations are invested in to allow the transport of increasingly larger shovels and caterpillar cranes. Reinder van Wieren joins the management in 1991. As from 1 January 1993 the inner borders disappeared in the EU. In the meantime, a considerable expansion of office and workshop had been achieved. In 1993 the company is certified according to the quality system ISO 9001. 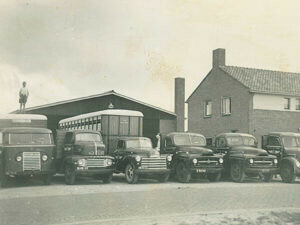 In that co-operation the subsidiary Coldstore Urk BV was founded in 1994 for the storage of frozen products. 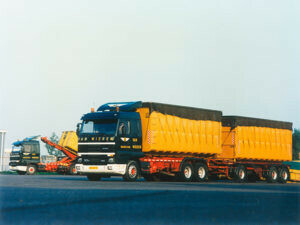 These years are marked by changes in the transport market. Open borders, stronger competition, but also new opportunities. This leads to fundamental choices. The internal organisation must be adapted due to the strong growth in heavy transport, in order to serve the clients accordingly. 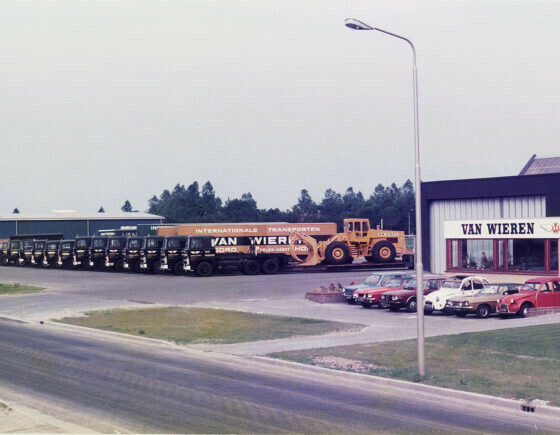 Two subsidiary companies are created: For the tarpaulin, cold and frozen transport: Van Wieren International BV and the heavy transport is provided by : Van Wieren Special BV In the meantime the staff has grown to approx. 75 FTE. All the company segments are also certified according to the latest ISO norm 14001, which mainly focuses on environment and quality. In September 2004 director Reinder van Wieren leaves the company. 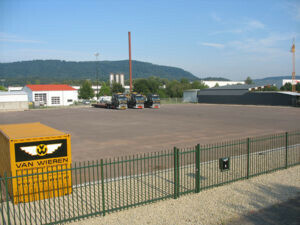 The branch in Konz is founded in 2006 due to the increasing demand for special transport in Germany. Harm van Wieren retired in late 2006. 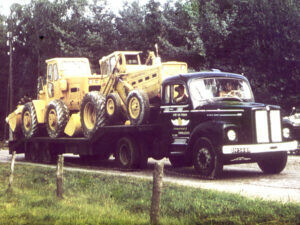 He managed the company for more than 30 years with Arjen van Wieren. In 2007 the ISO 22000 norm (food safety) is obtained for the company segments Van Wieren Beheer BV and Van Wieren International BV. In April 2008 a shareholding in L.C. 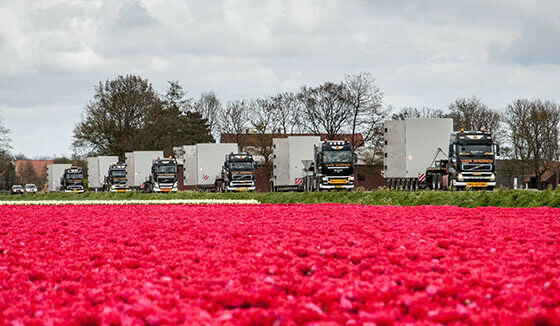 van Tiel Logistics BV is acquired. Global (door-to-door) container shipping, exceptionally heavy or large loads now also are possible. In late 2008 Arjen van Wieren also retires. 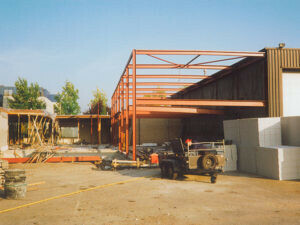 In late 2010 the shareholding in Coldstore Urk BV is sold to the other existing shareholders. 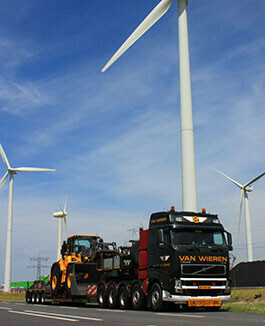 In early January 2013 the subsidiary Van Wieren International BV becomes autonomous and continues in future as a separate legal entity, with other shareholders and a new management. 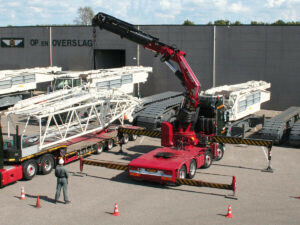 The general day-to-day management of Van Wieren Beheer BV and its subsidiaries (exclusive Van Wieren International BV) is handled by Richard de Graaf since mid 2011. In february 2015 Arjen van Wieren, former Managing Director and former shareholder, passed away. 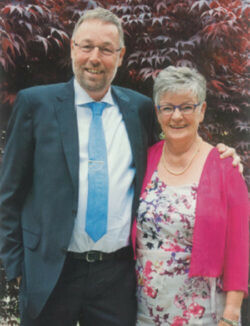 Our shareholder and director Harm van Wieren passed away on the 22nd of January 2016. At the beginning of 2018, in close consultation, we sold our interest in L.C. 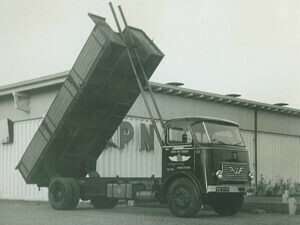 van Tiel Logistics BV. However, it was agreed that the parties would continue to make use of each other’s services.